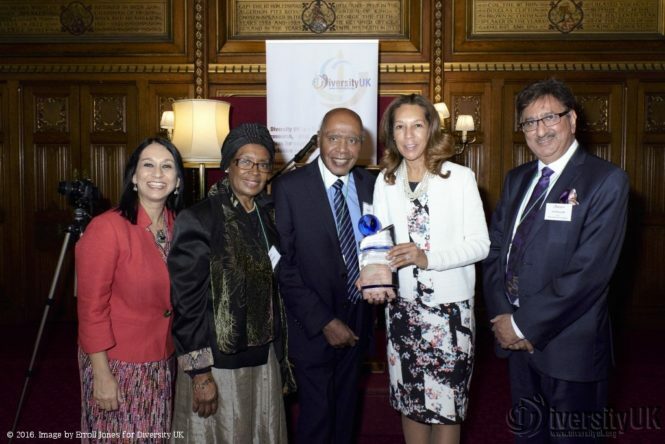 Diversity UK yesterday honoured race equality campaigner Paul Stephenson OBE with a Lifetime Achievement Award for his work on diversity and inclusion. Mr Stephenson was presented with his award by Helen Grant MP, Dilip Joshi MBE, Chair of Diversity UK and Anil Bhanot OBE, Chair of the Ethnic Minority Foundation, on Wednesday 23rd November 2016. Helen Grant MP, who gave the first Diversity UK lecture named in Paul Stephenson’s honour, spoke about the need to celebrate and recognise the contribution he has made to race equality. “His courage paved the way for me and for many of us in this room to pursue our own hopes and dreams,” she said, “and in doing what he did, he made this country a better, fairer, happier and more equal place”. She said that Paul Stephenson was a true inspiration. In his acceptance speech, Mr Stephenson urged the audience “to do their duty to stand up to racism and tackle the challenges for the sake of their children and their children’s children”. He later signed copies of his book ‘Memoirs of a Black Englishman’ (Tangent Books) for members of Diversity UK and guests that included representatives of the British Army, Hindu Lawyers Association, Metropolitan Hindu Association, Black Cultural Archives, Runnymede Trust, the Civil Service and the media.